Christian Pulisic (10) gets past Panama goalkeeper Jaime Penedo to give the United States a 1-0 lead in its World Cup Qualifying win. 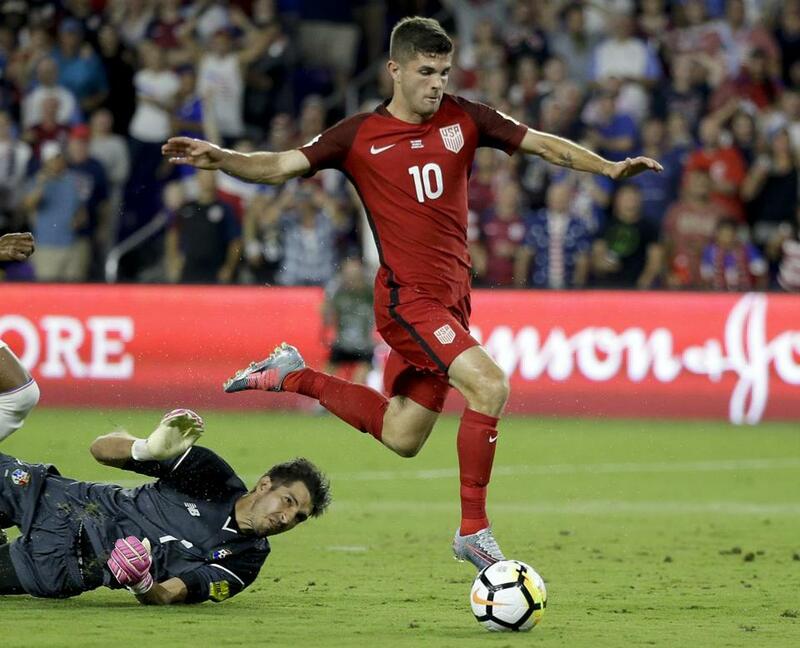 ORLANDO, Fla. — Teenage star Christian Pulisic scored with a brilliant touch to complete a field-length attack just eight minutes in, then split the defense with a pass that set up Jozy Altidore for the first of the forward’s two goals and put the United States back on track for next year’s World Cup with a 4-0 rout of Panama on Friday night. Pulisic fed Altidore for a 2-0 lead in the 19th. Altidore converted a penalty kick with a chip in the 43rd after Bobby Wood was fouled, and Wood added a goal in the 63rd. The US ended a three-match winless streak in qualifying and, with 12 points, moved 2 points ahead of Panama into third place — the last automatic berth — in the North and Central American and Caribbean region. Honduras has 9 points going into its match Saturday at Costa Rica, which is second with 15. Goal difference means the Americans put themselves in great shape to reach an eighth straight World Cup, almost certainly with a win Tuesday at Trinidad and Tobago and likely with a draw if Honduras fails to win Saturday. The US is plus-five to minus-two for Panama and minus-seven for Honduras. The region’s fourth-place team advances to a playoff next month against Australia or Syria. ‘‘We could have finished better on the day and scored more goals,’’ US coach Bruce Arena said. Playing his first international match since he turned 19 last month, Pulisic was moved to central midfield from the flanks by coach Bruce Arena and sparked the attack from the opening whistle with pace and ball control seldom seen from Americans. After Gabriel Gomez broke free from Omar Gonzalez and shot over the crossbar, Tim Howard’s goal kick was headed forward by Bobby Wood about 10 yards past midfield. Altidore one-timed the ball ahead to on a sprinting Pulisic, and the midfielder reached back with his left leg to flick the ball ahead. Pulisic jumped to avoid Roman Torres’ challenge and used the outside of his right foot to play the ball forward. As goalkeeper Jaime Penedo came off his line, Pulisic used the outside of his right foot again to play the ball wide and jumped over Pinedo’s outstretched arm. At the edge of the 6-yard box and just 2 yards from the endline, Pulisic reached with his right foot to slot the ball in, completing a 112-yard US move. Pulisic tumbled over as the ball rolled in for his eighth goal in 19 international appearances, his fourth in the hex. Pulisic created the second goal when he played the ball between his feet and faked Michael Murillo on the left flank. Pulisic broke ahead and fed Altidore, who split the center backs and redirected the ball in from 5 yards for his first goal of the hexagonal. At that point, Pulisic had played a part in 11 of the Americans’ 14 goals in the hex. After Wood and Altidore failed to convert good chances, Wood drew the penalty kick when he exchanged passes with Paul Arriola along a flank, broke past Felipe Baloy, spurted diagonally into the penalty area and was pushed down by Armando Cooper. As Pinedo dived to his left, Altidore chipped the ball down the center for his 41st international game. Wood added his 10th international goal off a pass from Arriola. Panama was trying to move into position to qualify for its first World Cup. The Panamanians were 90 seconds from advancing to a playoff against New Zealand four years ago, when Graham Zusi and Aron Johannsson scored late goals at Honduras, which dropped Panama behind Mexico and into fifth place.